In the gallery from January 9 – February 22nd, ArtsWest presents Dee Dee Redux, a retrospective of work by Seattle-based artist Deborah Faye Lawrence, primarily featuring work made since her move to Seattle from Los Angeles in 1993. Lawrence manipulates images she finds in popular culture to create intricate collages that are at once political and vulnerable. 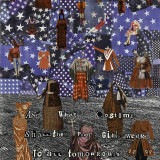 In mythic scenes whose imagery is made up of hundreds of bits of cut paper interwoven with text that serves as a ransom-note-style history lesson, the artist offers for our consideration such issues as imperialism, gun-control, fracking, and women’s rights since biblical times. Dee Lorenzo is Lawrence’s alter-ego who made her first appearance in 1999 as the subject of a series of works called Dee Dee Does the First Amendment. Dee Dee is young and old; she is an activist and witness. While she is specifically featured and named in some of the work, she pervades all of it. She oversees the works’ creation; she ordains the dissection of these issues relevant to our time—to all of human time. She is the beautiful, tattooed, red-haired girl stoic with her picket sign “Get your weapons out of my constitution” in Million Mom March and she is the gun-shot Mary in the same piece. The epic project Dee Dee Does Utopia was funded by a grant from Creative Capital Foundation in 2005. Lawrence began the project by sending an email query to 200 people: “What does Utopia look like to you?” The responses she got informed 26 versions of utopia, including Beachtopia (for the many people who included the beach in their utopia), Bibliotopia (for those who wrote of books and libraries) and Petopia (a utopia that includes our beloved animals). Quotes from participants float through or frame the artist’s illuminations of these collective visions. The series culminated in the book Dee Dee Does Utopia, available now from D.A.P./Distributed Art Publishers, New York (ISBN 978-0-9778028-4-5). The series Dee Dee Does PTSD resulted from a terrifying experience Lawrence had four Januaries ago. Upon arriving for a teaching job in Casper, Wyoming, she stepped out of her car and fell on black ice, landing on the right side of her head. She was rushed to the hospital, where emergency brain surgery halted a subdural hematoma. While referencing their original function as gendered accessories to servitude, Lawrence’s Service Trays have a repurposed aim to serve individual understanding. Assassination Day Trays describe a poignant autobiographical incident that happened on the day Martin Luther King Jr. was killed. Like Dee-Dee Lorenzo, Deborah Lawrence’s role in the space she occupies is charged and intentional. She approaches her work with sincerity and wit, consistently choosing specificity over ambiguity. ArtsWest is honored to present this first small survey of work spanning Lawrence’s prolific, heart-infused career.